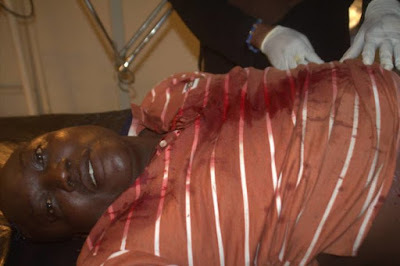 A former Chairmanship aspirant in Kosofe Local Government area, Hon Ibrahim Mustapha, narrowly escaped death on Thursday when suspected political thugs attacked him at Anthony Village, Lagos, with machete. According to PM News, Mustapha was allegedly attacked by political thugs suspected to be working for the Special Adviser to the Governor of Lagos on Food Security, Ganiu Okanlawon and a member of Lagos State House of Assembly, Hon. Bayo Oshinowo, and matcheted him severally on the head. Eyewitnesses said that the assailants, numbering about five, swooped on him and allegedly inflicted deep machete cuts on his head and other parts of his body. Some of his supporters who were with him also sustained various degrees of injuries. It was gathered that the attack on Mustapha occurred at Adebayo Mokuolu Street, Anthony Village, in Kosofe Local Govt. Area of the state. It was learnt that Mustapha, who was also a former Councillor in Kosofe LG, Lagos, was initially rushed to two nearby hospital and was rejected before he was taken in at the Life Fountain hospital. The victim was reportedly stitched at several places on the head. The political thugs led by one Akeem Oshijinrin and Dayo Lawal, were allegedly given coverage by the Area Commander of the Area H Command, Ogudu and his men, who were present at the scene of incident. PM News learnt that the suspected thugs chased Mustapha to a place where he could no longer escape and macheted him severally. It took the intervention of passers-by who carried him to the hospital. It was also alleged that the Area Commander who was on ground to provide security to APC for the primary election provided shield for the thugs who eventually escaped. It was gathered that while Mustapha was being attended to, some of the thugs came back to finish their undone business. It was at this point that one of them named ‘Nokia’ was caught while trying to escape on a bike. He eventually escaped but he left his bag which contained machetes and local guns.